Internships are key to building experience as a student or recent graduate. Employers are much more likely to hire someone with internships and work experience, rather than someone with a generic resume, lacking experience. Many internship opportunities help set the foundation for your career. The summer is a perfect opportunity to focus on what needs doing and to gain that all important experience. 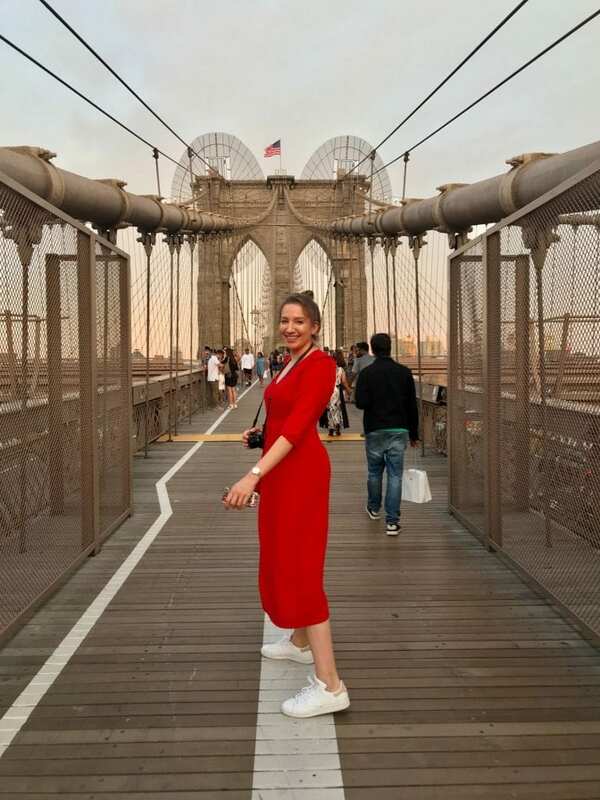 Here we explain the benefits of undertaking an internship and what you need to consider when building on your own brand, networking and online presence, along with the softer skill benefits it offers. You can gain a lot from doing an internship. From being able to develop common workplace skills such as team work and commercial awareness, to demonstrating work experience on your CV and making new connections with employers. You will be able to explore a field of work and reflect on your strengths and weaknesses to build your confidence, and understand how theory and research relate to practice in a work context. Last, and not least, you will have an opportunity to earn money. Find a summer internship in our UCL Careers Summer Internship Scheme where you will be paid London Living Wage. Opportunities are live now until 24th March. You can also browse other opportunities on myUCLCareers. For some roles, especially in media, fashion and design, it’s important to have a portfolio of work to show employers at interviews. This could include photos, drawings, examples of writing or anything that demonstrates your creativity. You could use the summer to build an online portfolio in the form of a website then use the link on your CV or in future applications. If you have made some connections over the year, you can re-visit them. Leverage your network to identify people who are in your desired field or industry and set up an informational interview to learn more about your potential career path. Begin speaking with potential mentors, such as UCL Alumni and build relationships with existing mentors. This will put you in a strong position after you graduate and it will remind important people that you are both interested and interesting! Linked to networking your personal network is how the outside world sees you, including prospective employers. Sites like LinkedIn, Instagram and Facebook can be powerful tools to let employers know who you are and what you can do. The first step in making an informed decision about anything relating to your career is understanding yourself. If you don’t really know what you want or what you are good at then this can be really hard. Use the summer to get to know yourself a bit better. Travelling, making new friends or learning new skills through online courses can be a really good way to bring out your strengths and help you find your passion. Don’t forget, you can always come into UCL Careers for a short guidance appointment with one of our Careers Consultants. Find yourself an opportunity through the UCL Careers Summer Internships Scheme, or through the myUCLCareers vacancies tab. 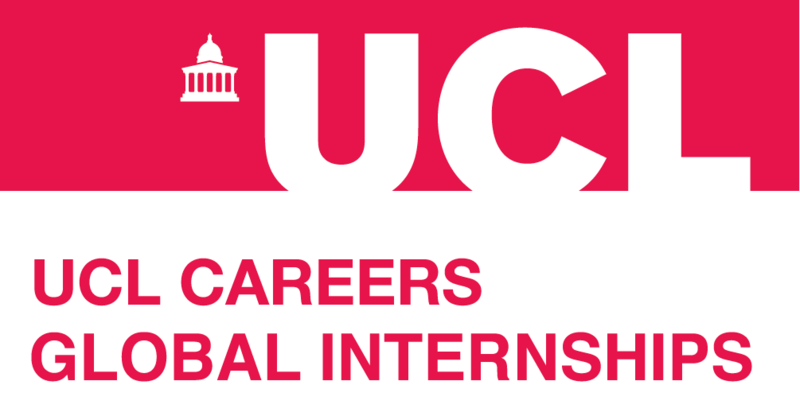 Deadline for applications for roles in the UCL Careers Summer Internships Scheme is Sunday 24th March. 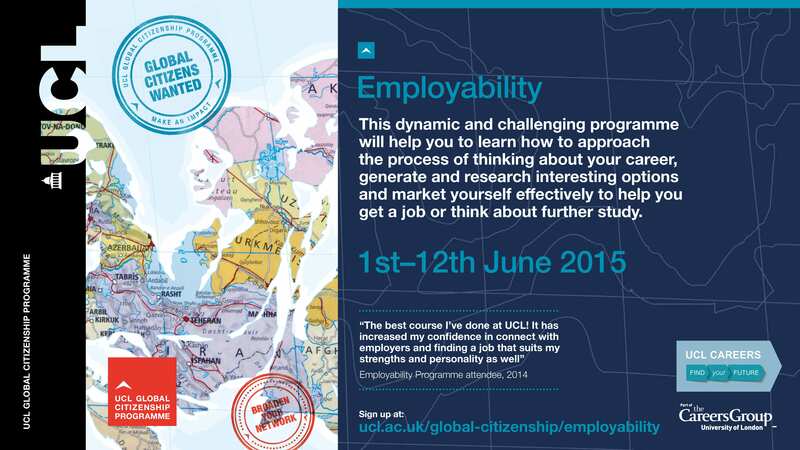 The Global Citizenship Employability Programme is open for bookings! On Friday 20th February UCL’s Global Citizenship Programme launched, and undergraduates across UCL will be able to register to take part in one of the different programmes taking place from 1-12 June. It’s made up of 7 different strands to choose from: 4 targeted at first years and 3 more open to 2nd years, penultimates and finalists. The Global Citizenship Employability Programme (GCE), run by UCL Careers, is one of these latter strands – so if you are thinking about what your future may hold beyond UCL, read on! What will you gain on the GCE programme? UCL Careers Global Citizenship Employability Programme is an exciting and very hands-on 2 weeks. This programme is ideal for students who are interested in having a fulfilling and rewarding career, and who want to prosper in a global jobs market. In many ways the GCE programme is an ‘employability crash course’. During the programme, you will take part in interactive workshops helping you to build an effective CV, perform well at interviews and assessment centres, build your network, search successfully for jobs and understand the graduate labour market. Importantly, the programme begins with a full-day dedicated to helping you discover, and articulate, your strengths, which you can then use to help develop your career. priority access to more employers at our Jobs Market, most of whom will have live vacancies they want filled! Support to develop a personal action plan that you can take with you, helping you identify key steps you need to take to enter and prosper in a global job market. What did people say last year? Don’t just take our word for it – check out our video and hear from attendees at last year’s programme and come along to our information session held Friday 27th February in Archaeology LT G06 at 1pm for more information, and to hear some case studies of students who succeeded from last year’s programme. And most of all, be sure to register and come to UCL Careers to pay your £20 deposit to secure your place! 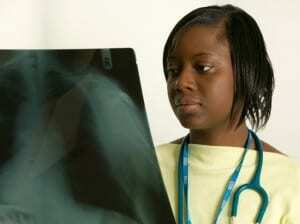 University is the perfect time to investigate different careers, to see which one fits you best. Don’t worry, but take the time to explore different options, get some work experience and discover a career that you would like to follow. Many people take the skills that they learn on their degree to move into something completely different. Even if you take a vocational degree, you will still learn transferable skills in communication, problem solving and research, which will enable you to work in a wide variety of different jobs. Some graduates feel pressured to go into the career that they think will earn them the most money. Careers with high salaries are often extremely pressurised, with long hours and lots of stress. Working out what you actually want from your career, and finding a job that provides a good quality of life, can be much more important for your happiness than a high salary. 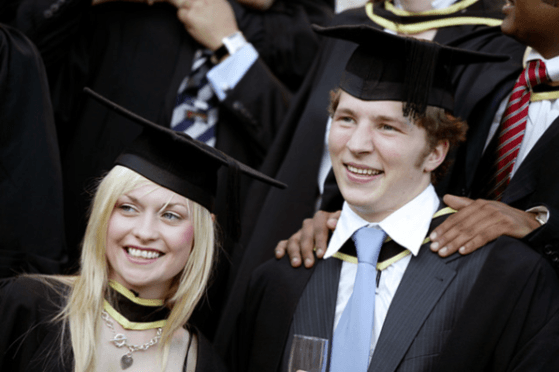 You can apply to study for a GDL (Graduate Diploma in Law) if you are a graduate from any subject. Many law firms actually prefer students to take a different degree before studying for the GDL as they believe that it makes candidates more well-rounded individuals. There are lots of jobs in healthcare, many of which do not even require a Science, Technology, Engineering or Mathematics (STEM) degree. Instead of studying to become a doctor, you could choose to become a physiotherapist, a paramedic or a clinical psychologist. Most of these careers require a specific degree, but it is often possible to retrain in one of these areas after completing a degree in a different area. In addition, there are many jobs available for arts, humanities and social sciences graduates, such as speech and language therapist, counsellor, arts and music therapist, or healthcare manager. Humanities graduates are often great candidates for jobs in the financial sector as they have excellent communication skills and research abilities. You will also need to have good numeracy skills (e.g. A level Mathematics) and may have to undergo some postgraduate training. Although it might seem like there are more well-paid careers available in STEM areas, in fact graduates from both types of degree are likely to find well-paid and rewarding careers. It’s important not to study a subject just because you think it’s more likely to bring benefits in the future; focus on what you find interesting and enjoyable, and look for careers that incorporate these elements.